Cost to clean a rug varies greatly by region (and even by zip code). Get free estimates from Carpet Cleaners in your city. Cost to clean a rug varies greatly by region (and even by zip code). The average cost of cleaning a rug is $160​. Area rugs are great elements for style, comfort, and function. However, with heavy foot traffic and wear, rugs often find themselves in need of a cleaning. In fact, rugs in high-traffic areas are recommended to be cleaned at least once a year. In this cost guide, we’ll look at the many factors and options for rug cleaning to decide which solution is right for your rug. The most common way to charge for rug cleaning is by size. The average cleaning cost is $2-$5 per square foot, which means a standard 8’x10’ rug would cost $160-$400 to clean. The higher cost processes typically include a decontamination bath. Synthetic area hugs are the most resilient and the least expensive to clean. Natural fiber rugs, such as silk and wool, are more delicate and require a different cleaning process, which can raise the price by up to 20%. Rugs that are older or more delicate may also have a higher cleaning fee, up to 35% more than standard costs. Most cleaning companies start by vacuuming the rug. The traditional method is steam cleaning, which soaks the rugs with water and cleaner, removes the dirt, and then requires rugs are dried for a few days. Chemical cleaning involves less water but more cleaning solution and a faster drying time. 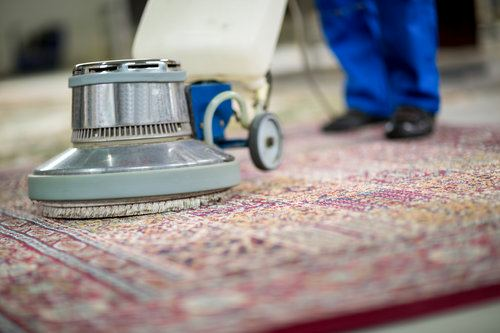 The price for the two processes is comparable (around $2-$5 per square foot), and more services will inspect a rug before making a decision on how to best clean it. Some companies wash rare and delicate rugs by hand and hang them to dry. This is the most labor-intensive option and regularly the most expensive, averaging $4-$8 per square foot. For rugs that are stained or have pet dander, many cleaners will offer a spot-cleaning service. This option focuses on pre-cleaning and deodorizing solutions on the affected areas before the entire rug is cleaned as normal. Prices range from an extra $1-$3 per square foot. Some rug cleaning services offer pickup and delivery services, typically for $25-$50 per rug. Adding a protective sealant can help the rug sustain further damage and stains. The process averages $0.50 per square foot for wool and silk rugs and $0.25 per square foot for synthetic rugs. Older rugs may be susceptible to moths, which can destroy the fibers. A professional cleaning usually gets rid of moths, but you can also add a special moth treatment solution for around $50. The DIY method of renting a rug cleaner from a store kiosk works for most rugs. The average rental cost is $30-$60 per day. Some rug issues require the use of additional specialists. For example, fixing burn holes could require a carpet repair specialist, at a cost of $150-$225. Some rug cleaning services will repair mold and water damage for an additional fee (around $200-$300 on average), while others may refer you to a restoration specialist. Many rug cleaning companies offer coupons, or discounts if you schedule regular maintenance appointments. Note that some providers require a minimum price or rug size to clean your rug. How much does it cost to clean a rug in my city? Cost to clean a rug varies greatly by region (and even by zip code). To get free estimates from local contractors, please indicate yours.